A former Vanguard Group Inc. in-house attorney and ex-Sullivan & Cromwell LLP associate has hit the investment manager with a False Claims Act suit in New York state court alleging it illegally evaded more than $1 billion in federal and state taxes over the past decade, the plaintiff's attorney said Friday. Former Vanguard associate counsel David Danon's complaint against Vanguard was filed last year and unsealed Friday, according to Danon's attorney, Brian Mahany of Mahany & Ertl LLC. The suit alleged that Vanguard failed to pay taxes and file tax returns for several years in New York, even though it derives substantial economic benefits from the state, including holding a lucrative contract for New York's Section 529 college savings plan. "Vanguard has operated as an illegal tax shelter for nearly 40 years," providing services to mutual funds at "prices designed to avoid federal and state income tax," sheltering hundreds of millions of dollars of income annually, and avoiding about $1 billion of U.S. federal income tax and at least $20 million of New York tax over the past decade, according a copy of the complaint posted to Mahany's blog. A Vanguard spokesman said in a statement that the company believes the suit is without merit and intends to "defend the matter vigorously." "[W]e believe it is important to emphasize that Vanguard adheres to the highest ethical standards in every aspect of our business," the spokesman said. "It is also important to note that Vanguard operates under a unique mutual structure and has a long history of serving the best interests of its shareholders." Danon served as associate counsel at Vanguard from August 2008 to June 2013, and his previous career stops include stints as an associate at Sullivan & Cromwell, Cleary Gottlieb Steen & Hamilton LLP and Chadbourne & Parke LLP, and as tax counsel at Bingham McCutchen LLP, according to his LinkedIn page. Mahany said Danon believes he was terminated by Vanguard after he filed his whistleblower suit. According to the suit, Vanguard represented in various filings with New York over the past decade that it had filed all required state returns and paid all required New York taxes. But in reality, despite having significant business contacts with New York, Vanguard failed to file state tax returns between 2004 and 2011, according to the suit. Vanguard's 2011 and 2012 New York returns were deceptive and misleading with respect to its New York business activities, making the state Department of Revenue less likely to inquire about prior tax years, Danon alleged. 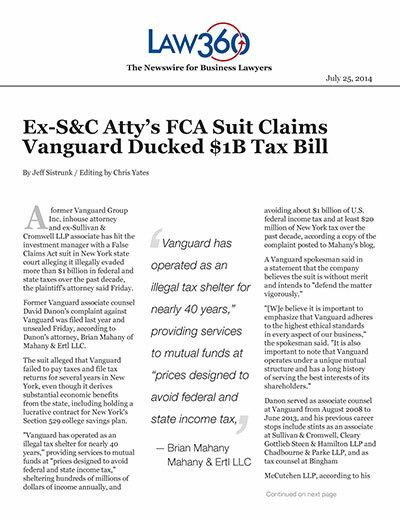 "Because Vanguard failed to file New York tax returns for all years prior to 2011, Vanguard is liable for all unpaid tax, penalties and interest for these years, and because Vanguard prepared false documents in connections with these failures, the False Claims Act applies with respect to these years," the complaint said. The complaint also claims that Vanguard provides services to mutual funds at artificially low, "at-cost" prices, in violation of New York tax law. "As a result, Vanguard shows little or no profit and pays little or no federal or state income tax despite managing funds with nearly $2 trillion in assets," the complaint said. Vanguard also knowingly and fraudulently failed to report and pay tax on its $1.5 billion "contingency reserve," which is collected from shareholders and used to cover unanticipated losses incurred by Vanguard or its funds, according to the suit. New York's portion of this income should result in between about $7 million to $14 million in additional tax liability, the complaint said. Mahany noted that, while the complaint focuses only on New York taxes, its allegations point to "much larger implications" for Vanguard. Danon is seeking a court judgment against Vanguard equal to three times the amount of damages the state has sustained, plus a civil penalty of $6,000 to $12,000 for each action in violation of the FCA. He also is requesting 15 to 30 percent of the money recovered by state and local governments. Danon is represented by Brian Mahany of Mahany & Ertl LLC. The case is State of New York ex rel. David Danon v. Vanguard Group Inc. et al., in the Supreme Court of the State of New York, County of New York. The case number was not immediately available.